HF 5 Drawer Rolling Tool Chest--US General Pro---another HF Gem! 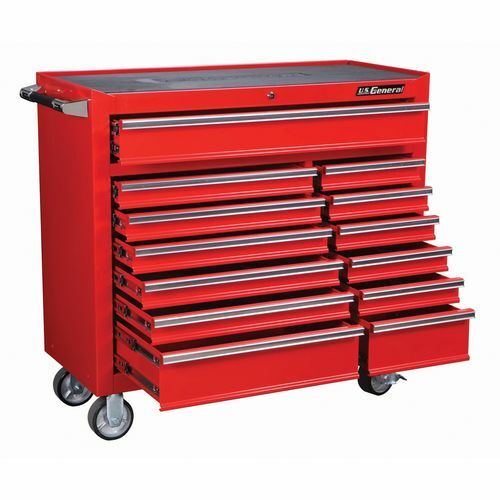 Harbor Freight US General Pro, Rolling Tool Chest--Another HF GEM! Hello folks. I have not been on here much as work has kept me very busy since the new year. Anyway, I still browsethe HF flyers that are sent my way. I have had my eye on this rolling tool chest for over a year. Regular price is @ $299. Of course we can use a 20% coupon almost any time, but I kept wating to see of this would go on some crazy sale. It has!!! Just picked this up last week for $169.00 on sale from the current flyer. I did not try to stack the 20% coupon, as I thought this was a super deal as is. I have put it together and have used it and WOW, I am impressed! First thing I noticed, was the size of the wheels. 5 in casters!!! Very stout! Rolls wonderfully. Drawers are so smoooth. Really nice paint with no scratches or obvious dings of defects. I did need the hlep of my son at the end of the install as you have to lift up the chest and slide it into the rails on the base, then screw it in place. We almost got our fingers caught! Instructions were pretty good. Pics a bit small, but there is text and it was easy to figure out. Put together in @ 35 mins. The top has to be open in the “up” position to “unlock” the drawers to open. Also each drawer has a finger slide lock. I did a net search and found a Grizz model that looked almost exactly the same for $355. The metal is pretty stout, but of course it’s never as thick as we would like it, HAHA, but for this price it’s great. This is the best HF purchase I have ever made….check it out. You waited a year and didn’t use the 20% off coupon?? Were you feeling sorry for HF. LOL! Still a good buy. I’ve checked them out at the store. Bogey, I know, it’s just a me thing..I’m just not a “gouge for the last dollar” kind of guy. I try to support the local businesses , many here are having rough times and to me 20-30 bucks is petty cash. I rather have the store here than have to drive 30-40 mins to go to the next one if mine closes. Everyone elses situtation may be different and I understand that. The 20% coupon does not apply to this anyway as the coupon excludes tool storage. I know, I tried with this exact product. I was wondering, why the 4 star rating? You didnt mention any issues. I have this and it is an absolute fantastic product. I keep all of my “other” tools in it, like automotive tools. I have found no defects with mine after owning it for 6 months now. 4 stars because the top has to be open to open the drawers….I don’t like that too much. Also, if you have been around here long enough, 5 star ratings are ridiculed if one does not own the product for a while before writing the review, i/e longevity of the product. How does this compare to other rolling toolboxes that you’re familiar with? I have the rolling cabinets with add on drawers and tool storage cabinet. They work great – smooth drawer operation. PK, I have experience with Craftsman, Waterloo, and Husky. The HF beats all of them except for the really high end Craftsman boxes. Of course, the cost of the HF is waaaaay lower than even an average Craftsman rolling tool box, and I’m saying that as a guy who has a ton of Craftsman tools and likes them. I can’t see a better value out there than this HF, and that is why I wrote this review. Y’all need to take a look at this one while it is on sale. I hear ya Tod. I looked at Kobalt, Craftsman and HF. I was sold on the smoothness of the drawers and the cabinet is well made. And for the price, I couldn’t go wrong. I have the drawers loaded and they work just fine. Small drawers full of screwdrivers, pliers, scrapers. Larger drawers full of wrenches, sockets, pry bars, hammers, air tools, etc. Storage cabinet full of routers, circ saw, sander, drill/drivers and more. I have this one for about 8 years, it has been excellent. The colors on mine are black and gold. The bottom drawer is loaded with big hammers, pry bars and other heavy stuff, it holds just fine. One more excellent purchase from HF. I built shelve and I installed my computer on the top of it. That’s the beast Bert! That is a ton of mobile storage in a very nice quality chest, for a super price.